The Duplo DF-1200 Air Suction Paper Folder provides the perfect tabletop solution for folding offset and digitally printed documents. 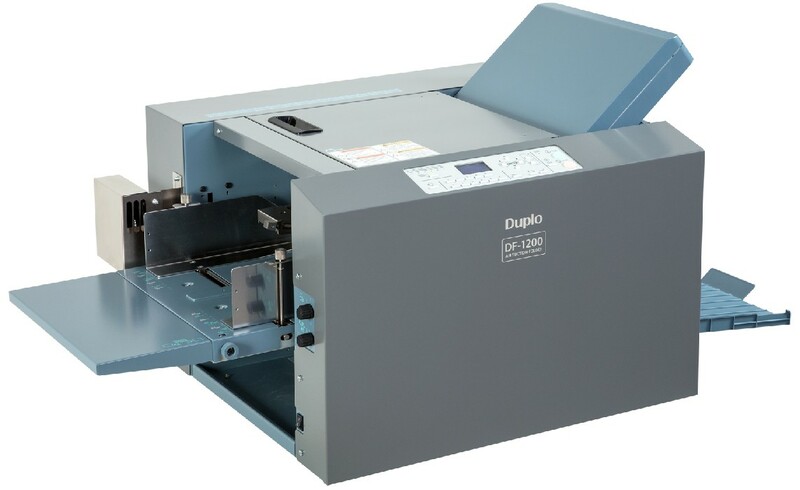 With a production speed of up to 260 sheets per minute, the DF-1200 utilizes Duplo’s renowned suction feed technology to handle static build-up in digital print applications and also comes equipped with Optical Double Feed Detection to ensure personalized jobs are folded one sheet at a time. Fully automated and quiet in operation, the DF-1200 is ideal for any office environment. The DF-1200 comes pre-programmed with six standard fold types including single, double, half accordion, letter, accordion, and gate – enabling users to fold a wider range of applications at the touch of a button. The DF-1200 automatically detects five of the most popular paper sizes from letter, legal, ledger, half letter and half legal, and sets the pre-programmed fold position without any adjustments required. Users can also create custom fold styles with non-standard paper sizes simply by moving the fold plates via the user-friendly control panel and save them into one of the 20 job memories. The DF-1200 can also reprocess single folded sheets into right angle folds. © 2019 Advanced Mailing Systems. All Rights Reserved.